Welcome to the Blacktail Mountain Ranch Co.
Blacktail Mountain Ranch Co. originated in 2003 in the heart of the Rocky Mountains of Montana. We have relocated to much greener pastures where our feed supplies are in much more abundance helping us to maintain fair prices. 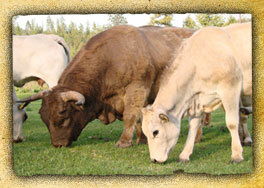 We have produced a new breed of beef cattle which we federally trademarked as HighMont Beef®. This breed is the first of its kind in the world. We have cross bred the Piedmontese from the Piedmont region of Italy with the ancient cattle breed of Scottish Highland, both of which are known for low saturated fat and low cholesterol characteristics. The resulting new breed named the "HighMont" capitalizes on both their remarkable qualities of low saturated fat, low cholesterol, taste and tenderness. 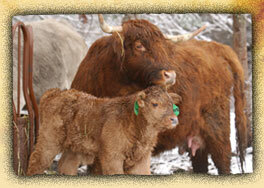 Our number one goal is to provide an all natural, heart healthy beef that also tastes great. We have received various endorsements but most importantly from a leading cardiologist who is listed on our Endorsement page. We hope our customers will understand that HighMont Beef® was originally designed with our family and friends in mind and our customers are therefore, treated like them. of your ingredients, the better the quality." "We want quality of life, and for our customers, we want to do the best we possibly can with our product."